Remember prices are always per person including VAT unless mentioned otherwise. Festively decorated tables with the appropriate flowers and room decorations are as important as a festive menu or buffet for all your personal occasions. We can accommodate groups up to 90 people; with the hotels in the vicinity up to 180 people. The buffet breakfast and dinner can be taken for the whole group together in our restaurant. We also help you for incentives or extras for your group. For group menus, other informations or questions, ask our "group menu" folder on the [contact # Contact # 2] page. If you still have other questions, do not hesitate! We will be happy to assist you. We offer discounts for groups for cash payment. 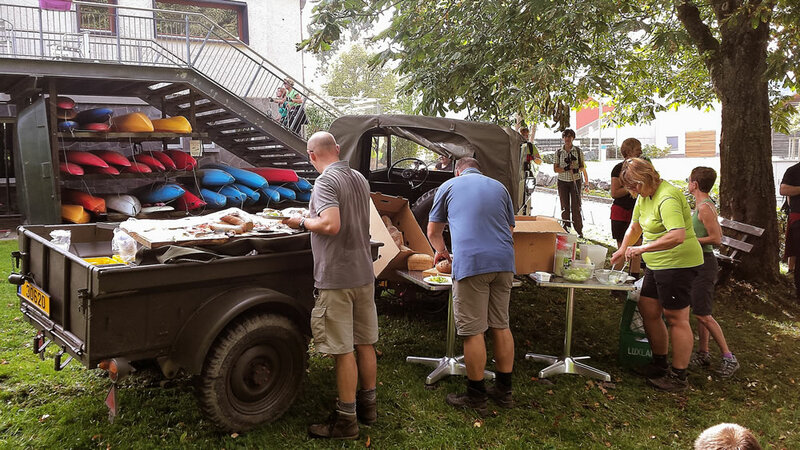 For groups and on request we can organise a picnic adventure with our vehiculs of the Belgian army. We await you at a chosen point of your route with everything you need.